You will remember Saint Ciarán of Saigir, who was born on Cape Clear, perfectly framed in our view from Nead an Iolair? He was known as the ‘First Saint of Ireland’, preceding Saint Patrick by almost a century, and also as one of the Twelve Apostles of Ireland. A manuscript dating from 1629 and housed in the Bibliothèque Royale, Brussels, tells how the Twelve Apostles were educated together in Clonard, Co Meath – the most important monastic school in early Christian Ireland – under Saint Finian. It is said that ‘ . . . there were no fewer than 3,000 pupils getting instruction at one time in the school in the green fields of Clonard. The master excelled in exposition of the Sacred Scriptures, and to this fact must be mainly attributed the extraordinary popularity which his lectures enjoyed. Finnian’s gift for teaching and his absolute dedication to the ascetic ideal, inspired a whole generation . 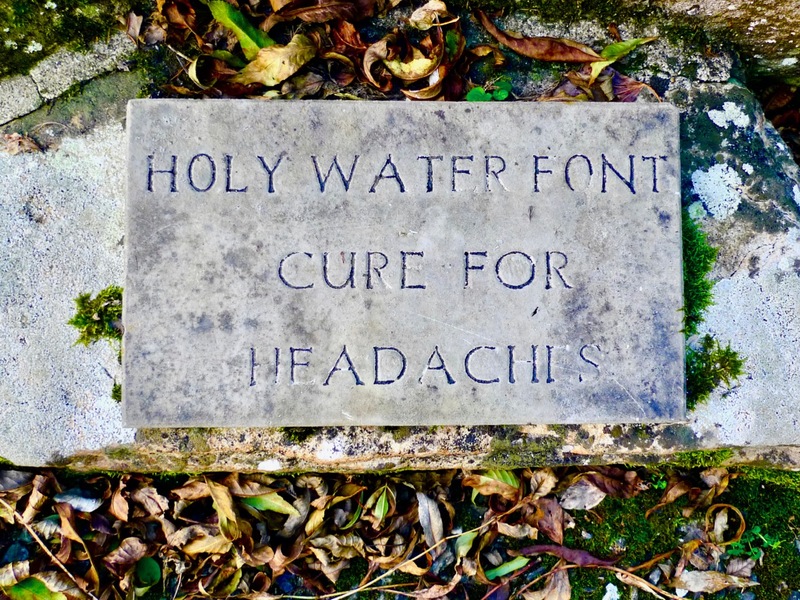 . . ‘ St Finian achieved the age of 140 years himself, while Ciarán – who went off to Cornwall where he is known as St Piran (you will also remember) – lived to be 206 before falling into a well on the way home from a wild party. There’s a lot to be said for being a saint in those days. Why are we revisiting St Ciarán? Well, we’ve just past March 5th, which is his day, so we have to celebrate him. 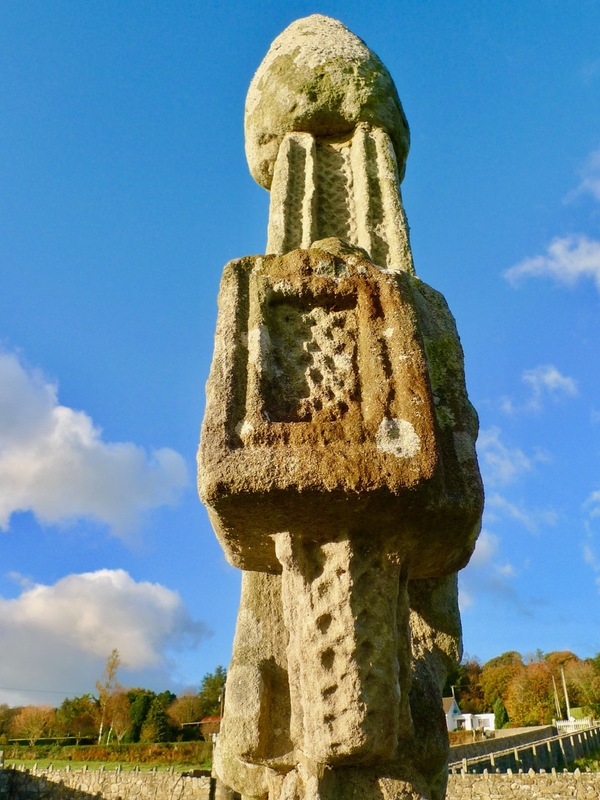 To do that we will go off to County Kilkenny, where there is a very important medieval site, noted for its high crosses but with plenty more to see: it’s a 45 minute drive north of Waterford city. 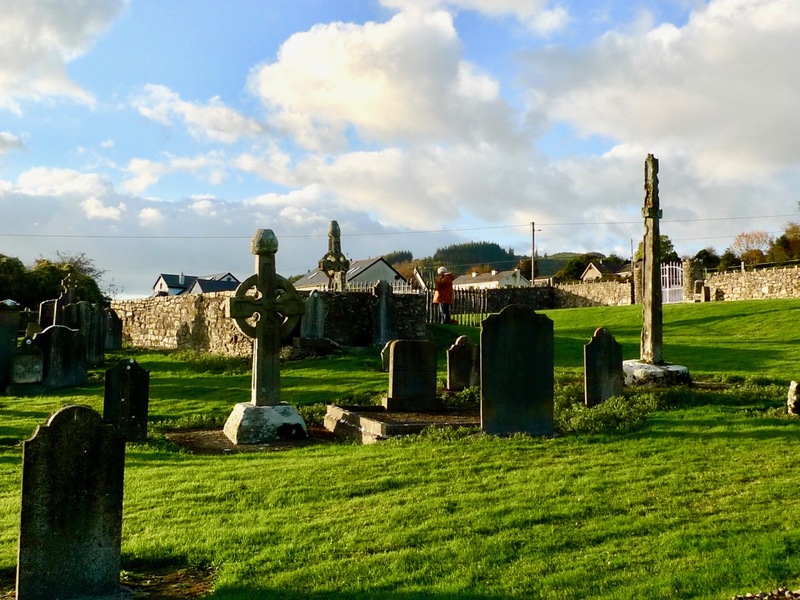 The site, known as Kilkieran (Kieran is an alternative anglicised spelling, prefixed by ‘Kil’ which means ‘church of’) was once home to a monastery founded by St Ciarán, and the high crosses date from the 9th century. To be able to see exquisite artistic medieval carved stone from 1200 years ago still standing where it was first placed is remarkable. In other discussions on high crosses and similar works of expertise we have asked whether these gems should be preserved out of the elements – as some are – to prevent the deterioration which is undoubtedly taking place. While I tend to favour that approach – and it seems to me to be particularly appropriate where they are replaced by high quality replicas ‘in the field’ – there is something very special about visiting intact sites like this one. The whole conservation process is full of dilemmas. 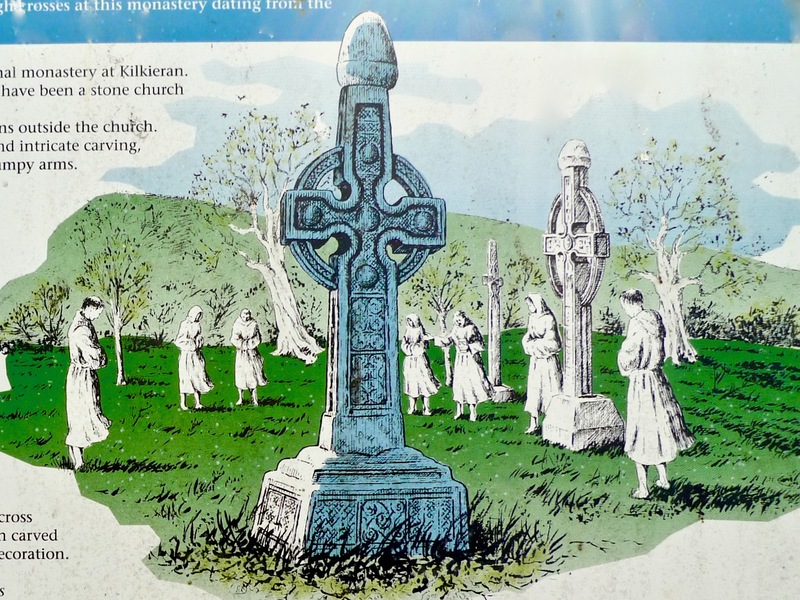 There were once four crosses at Kilkieran. Three are still complete and in reasonable condition, although much weathered, while the fourth is just the stump of a shaft. One – the East Cross – is unusual: it is slender, largely undecorated, with minimal crosspieces and no roundel. There’s a nice little tale about it: the cross was attacked and destroyed by iconoclasts, but was painstakingly reconstructed in the mid-19th century by blind local stonemason Paddy Laurence, who had lost his sight while working on the construction of the Palace of Westminster in London: the old Palace had been ravaged by fire in 1834 and was rebuilt to its present design under the auspices of Charles Barry and Augustus Pugin. 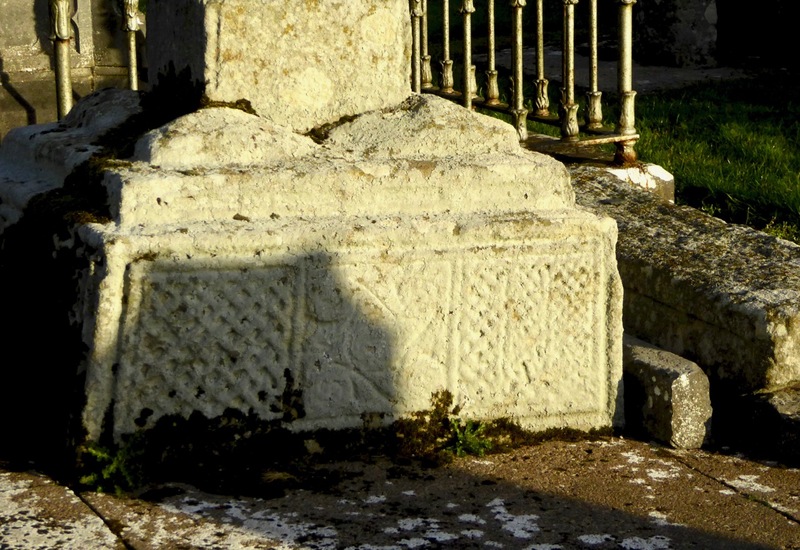 The high crosses at Kilkieran are simpler and less decorated than many others, but have a great dignity, especially in the context of the burial ground which has grown up around them. We were fortunate to visit them on a really clear day, when the shadowed relief stood strongly out. 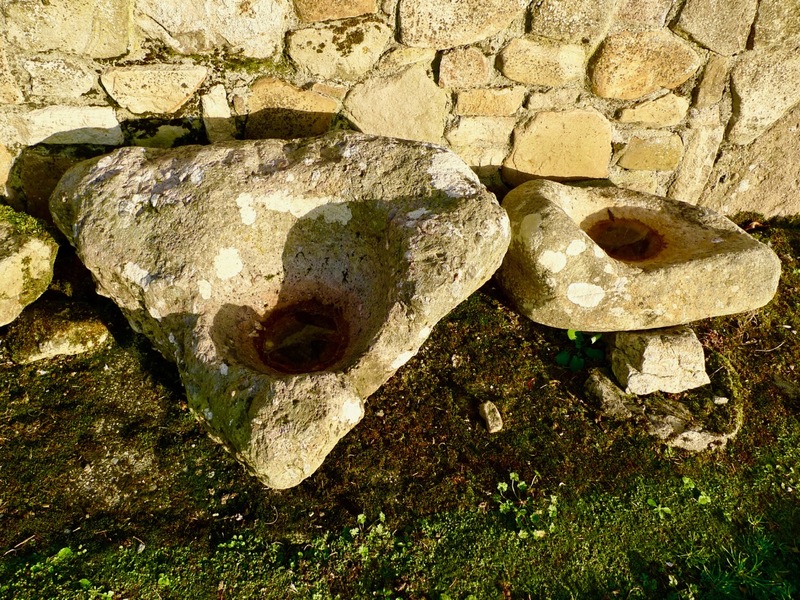 You will want to go to Kilkieran yourself: when you do, don’t miss some fine ancient grave slabs and the nearby Holy Well. 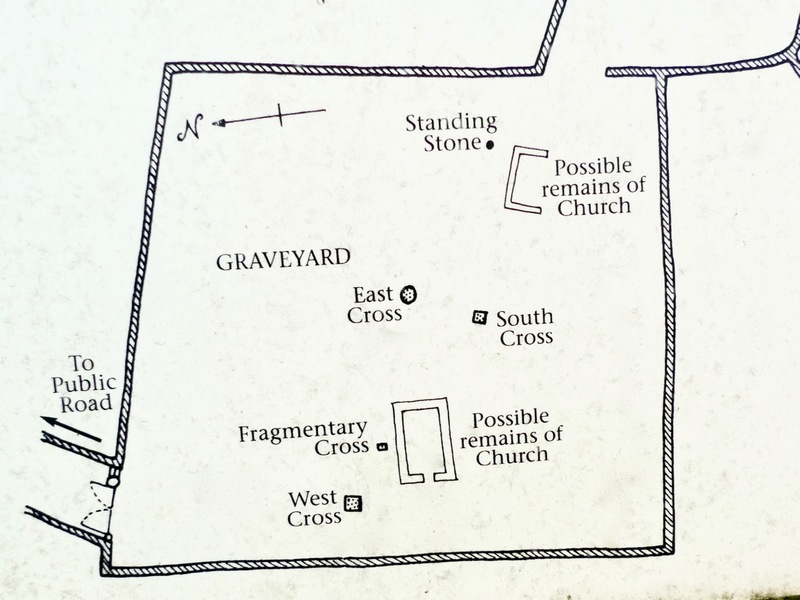 Then you should take yourself off to the other High Cross sites in what is known as the ‘Ossory Group’, beginning with nearby Ahenny. I’ll be writing about them all soon.